By the end of January progress rate at the construction site was nearly 97%. 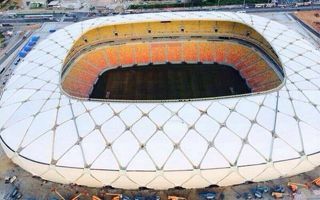 All seats and all strips of membrane are now installed, giving a very good idea of how the stadium will look during the 2014 World Cup. Another significantly delayed stadium of this year's World Cup is nearing completion. Previously hoped to be ready in December 2013, Arena da Amazonia reached 96.21% of completion on January 31. The day before workers installed the very last segment of fiberglass membrane on the facade. Overall there are 252 sheets mounted on the roof and facades, forming diamond-shaped blocks. The membrane is coated with teflon to ensure that dirt doesn't stick to it, reducing cleaning to basic water use. The outer shell of the stadium sees 31,000 sqm of membrane spanning between the steel frames. All of the sheets were manufactured by German company Cenotec and delivered to Brazil by sea. The stadium's interior and surroundings are also almost done. All seats, totalling at some 42,300, are in place, creating a warm yellow-orange mosaic. The stadium is expected to cost R$ 605 million ($250m / €185m) in the end, though initially the budget stood at R$ 499 million ($205m / €150m). Arena da Amazonia is regarded as one of the most controversial hosts for this year's World Cup. The city is located deep in the Amazon jungle, 2,000-3,000 kilometers from other hosts. There is also no strong club in Manaus to use the stadium after tournament games end. There are five local clubs interested in having at least partial tenancy of the stadium, though.